About this project Many Romanians work abroad for extended periods. Their children, who live almost like orphans, are deprived of social interaction and can often develop serious emotional and motivational problems. 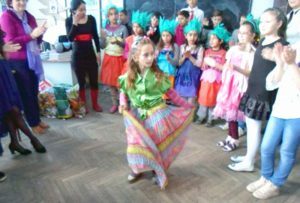 SI Club Craiova, with financial support from the Soroptimists of Hoorn Van Omstreken, have set up an after-school homework club to provide these ‘orphaned’ children with a structured and supportive learning environment. Soroptimists elsewhere in the country are also working to give disadvantaged and disabled students access to education. For instance, SI Club Brasov organised community-building workshops (attended by over 60 people) and a ‘soul fair’. The proceeds from these events were used to fund two scholarships. Children in the Roma community, Europe’s largest ethnic minority, often drop out of school before the end of their primary education. SI Club Slatina supported a group of 15 Roma children in Piatra, organising extramural classes and providing them with clothing and school supplies. SI Club Cluj Napoca set up a school for children aged 6-15 suffering from visual impairment. Here courses and workshops were run to improve their interpersonal communication and reading skills. In addition, ‘book club’ activities were aimed at awakening an interest in – and hopefully a passion for – literature.